Imperial Granum is a dainty,highly nutritious preparation of wheat, very useful for invalids and children. 1 Tablespoon of Granum. 1 Saltspoon of salt. 1 Teaspoon of sugar. 1 Cup of boiling water. 1 Cup of milk. Mix the meal, salt, and sugar in a saucepan, pour on the boiling water, and cook ten minutes ; then add the milk, and let it again reach the boiling-point, when it is ready to serve. Mush and porridge may also be made from this grain for the use of children, for whom it is an excellent food, being similar to farina, but more delicate and easier of digestion. 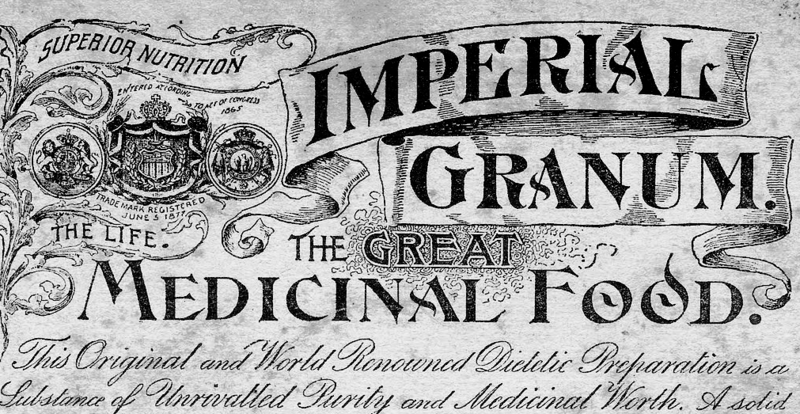 Imperial Granum may be obtained at any pharmacy. In this instance it’s also the subject matter of a rather delightful vintage advertisement. This advertisement bears a look because it reinforces our point about the joys of mixing and matching (or not) typefaces. Also, this advertisement is the inspiration for one of our current projects, which we’re going to call ‘Imperial Granum’. Not a wholly original name we know, but somehow the nam seems to fit a typeface derived from these hand-drawn letters. « Older Post Feel Free To Mix and Match…	» Newer Post Toys Which Were….